I’m having a cognitive crisis. Not because I spent three days in marathon grading mode wrapping up the fall semester. Not because of the incongruity of Christmas shopping and the season of Advent preparation. My crisis arises because I’m an academic. More specifically a social psychologist who studies contemporary American religion. I have long held to a core principle is social psychology: that human beings strive for consistency in their attitudes and behaviors. That lack of consistency or coherence is an uncomfortable situation that motivates people to change in order to alleviate the inconsistency. I keep running across data that is hard to reconcile with a cognitive consistency approach. It would appear from some of the data that people just aren’t very reflective about the positions they hold. In short, they don’t think deeply about contrasts between Christian theology and support for torture by the American government according a survey by the Washington Post. If they’re aware of the inconsistency, it seems fairly easy to ignore. Academics and journalists have a much higher commitment to cognitive consistency and strive to uncover the linkages that will explain the responses on the surveys. Perhaps, theologians argue, that belief in the efficacy of torture is naturally congruent with the assumptions of Penal Substitutionary Atonement (the theory that God had to punish the innocent Jesus who was voluntarily taking the punishment for our sins). Or maybe they just aren’t into cognitive consistency. Maybe after twenty-plus years of talking points and litmus tests, we respond in predictable ways as we think we’re supposed to without cognitively reflecting on how these responses align with other positions we hold, especially those that define us as Christians. But the social psychologist in me says that this isn’t normal and needs to be repaired. That, in summary, is the source of my crisis. Let me now try to expand my struggle. I distinctly remember learning the dominant views of cognitive consistency in my first social psych class. In fact, I decided to share this mini-lecture with my wife on our first date (she still remembers). Fritz Heider’s Balance Theory attempted to show how we can be placed in a position of inconsistency and feel great pressure to adjust. He used interpersonal relationship as an example. In his telling (shown on the right), a Person P has an attitude toward some object X. P also has attitudes toward another person O. 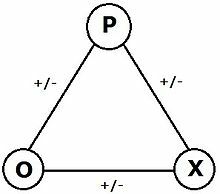 If P doesn’t like X and O does, then P should not like O. If P likes O and finds out that they have different ideas toward X, P feels pressure to either change his attitude toward X or find another friend. Heider explains that this is overly simplified. Nobody does this with a single X — but if you imagine large numbers of Os and Xs, you can see how balance is maintained. Fritz would have absolutely loved Facebook and Twitter. It’s his theory in daily practice. Osgood and Tannenbaum had a slightly more nuanced version of Balance Theory that they called Congruity Theory. It also focused on both attitudes toward people and objects but it added a more refined measure: the salience of the position held. They suggested that some attitudes are stronger than others and therefore more impervious to change. But incongruity is still a difficult condition and must be resolved. But both attitudes affected will shift toward some common position. It’s reminiscent of the old Groucho Marx joke, “I wouldn’t belong to any club that would have me for a member”. Here’s how it works. Attitudes toward things or people are scaled from negative to positive and from 0 to 3. So +3 and -3 have equivalent salience but in opposite directions. For the sake of example, let’s suppose someone has a mildly negative attitude toward President Obama (-1) and an off-the-charts positive attitude toward A Charlie Brown Christmas (+3). Then Obama tells everyone that Charlie Brown Christmas is the most important part of the family Christmas celebration. Charlie Brown Christmas can’t be that great anymore because the Obama family likes it. Obama can’t be as awful because he likes Charlie Brown Christmas. Notice that the more weakly held position moves further as congruence is restored. Then there’s Festinger’s cognitive dissonance theory. As most people know, when there is a conflict between two attitudes or an attitude and a behavior it creates dissonance that must be resolved by shifting one of the elements. The nice thing about dissonance theory is that it adds the possibility of eliminating the dissonance by adding a new element to the system (the way dissonant chords in music resolve when the right tone is added). Issues of the last several years — politics, media, religion — seem impervious to cognitive reshuffling. People on all sides hold to their pre-existing positions without any regard to new information. What factors contribute to this? One possibility is that there isn’t really a problem at all, but the inconsistent/incongruent/dissonant patterns are really methodological artifacts. For example, it’s possible that the evangelical-torture connection isn’t a rational linkage but a spurious correlation with party identification (especially in the south). If people in southern red states are more likely to vote Republican and more likely to hold to evangelical self-identifications, then their support of government policy on enhanced interrogation may have more to do with pro-nationalism related to party than with theological stance. Relatedly, what we’re seeing might be an artifact of the questions asked. A friend recently examined some data on gun control and showed how the framing of the question creates differential outcomes. It’s quite likely that similar things are happening when Pew asks people if they believe the Christmas story. More nuanced questions might come closer to the mental constructs people actually possess. Another possibility is that we’ve overplayed the monolithic nature of religion. Perhaps there are such diverse views present among American Christians that their different views cancel each other out. This recent piece by Cathy Grossman of Religion News Service tries to give voice to the diversity of religious thought. She quotes David Kinnaman from the Barna Group that no more than 7% of Americans are “theologically by-the-book evangelicals”. (I’ve written Kinnaman looking for the source data but haven’t heard back yet.) If this is legitimate, then a lack of congruence between theology and politics is not surprising. In fact, finding congruence or consonance would be the unusual thing. This becomes surprising when we consider how much Worldview language shows up in Christian rhetoric. For example, this week the folks behind YouVersion of the Bible released their most shared verses for the 2014. This year’s winner is Romans 12:2: “Do not conform to the pattern of this world, but be transformed by the renewing of your mind”. But renewing the mind requires work and change. It makes us think and reorganize our mental processes. Last night marked the end of The Colbert Report, where Stephen Colbert satirized the talking point world by taking it to its natural extremes. In his opening spot last night in his classic segment The Word, he argued that he’d gone nine years without changing. And while I’ve always reminded you to be afraid, folks, I don’t want you to worry. You see, on my very first show I told you truth doesn’t come from your head, it comes from your gut. And back then, my gut made you a promise. “I know some of you might not trust your gut yet, but with my help, you will.” And you did. Maybe Colbert come on the scene with an awareness that something had shifted in American society. That we didn’t rely on logic and coherence. The irony is that the devoutly Christian Colbert (the man not the character) probably has the most cognitively consistent view of the world one can find. Hopefully, he will continue to teach us much.